This video presents 4 categories of visual efficiency. Learning to Orient the Visual System, Helping the Visual System Move and See, Beginning to Process Visual Information, and Making Visual Processing Efficient for Learning. These categories are progressive in skill. 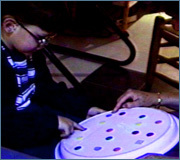 Profiles, functional vision skills, intervention, and transitional requirements are presented and demonstrated.